The Hygen Hound is a medium sized scenthound breed that originated in Norway. The Hygen Hound was recognized by the United Kennel Club in 2006. 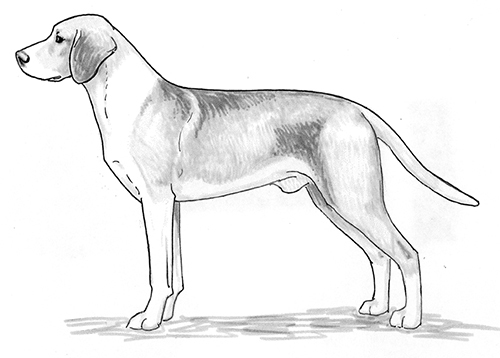 A medium sized, short coated hound that is solid and compact, slightly longer than tall, and has a strong topline. The head is moderately broad but not heavy. It is wedge shaped but never pointed. The skull is slightly domed. The occiput is not prominent. The stop is distinct. The muzzle is clean, broad and deep. It is rather short. The bridge of the muzzle is straight. Seen from the side, the end of the muzzle is rounded, not square. The lips are clean, not pendulous. The cheeks are clean and flat. The Hygen Hound has a complete set of evenly spaced, white teeth meeting in a scissors bite. The medium sized, dark brown eyes are not protruding. The expression is calm and earnest. Medium high set, thin and soft, hanging not close to the cheeks. The ears reach hardly half way to the nose when pulled forward. They taper towards rounded tips. Medium length and strong, not too throaty. The shoulder blades are sloping, and form a good angle with the upper arms. The legs are clean, solid and sinewy, but not heavy. The pasterns are short, broad and slightly sloping. The chest is medium broad, long, deep and spacious. The back ribs are particularly well developed, making the ribcage appear long. The depth of the chest is about one half the height at the withers. The back is straight and strong and the loin is broad and muscular. The croup is broad and slightly rounded. The belly is very slightly tucked up. The hindquarters are muscular and broad. The lower thighs are long. There is good angulation at the stifle and hock joints. The rear pasterns are short, broad and slightly sloping. High, arched and well knit, with firm, strong pads. Well covered with hair between the toes. The tail is set on level with the topline. It is thick at the root and tapers to the end, which reaches just to the hock joint. It is carried straight or in saber fashion. Straight, dense, shiny and somewhat rough to the touch, not too short. The back of the thighs and the underside of the tail may have slightly more coat. Red-brown or yellow-red, often with black shading, with or without white markings. Black and tan, usually with white markings. Predominately white with patches and ticking of red-brown or yellow-red, or with black and tan markings. The colors should be clearly defined. The ideal height for males is 21 inches. For females, it is 20 inches. Free, ground covering, and parallel.